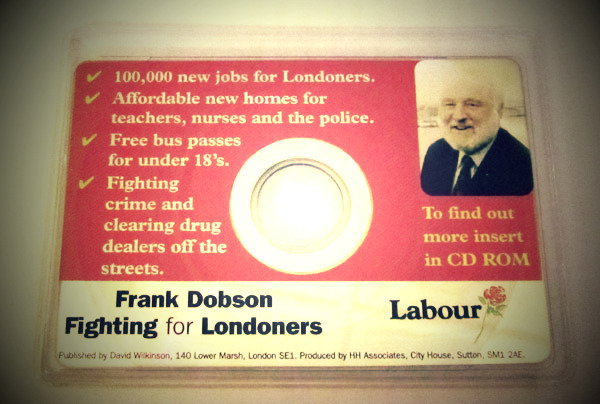 HIM being the electorally unbeatable local MP, I’ve asked Frank Dobson questions on nearly every subject over the last ten years – including that thorny one about his living in a council house. But there is one subject for which there is an almost silent agreement that we won’t discuss. And I can’t see much evidence of any journalist getting close to it either. In fact, a couple of weeks ago LBC interviewed all of the people that have stood to be Mayor of London in past London elections and Frank was, much to David Mellor’s heartless amusement, a noted exception. Truth is, Frank has hardly talked about it since his disastrous days as the official Labour mayoral candidate in 2000 and his defeat to Ken Livingstone, then standing as an independent on the grounds he felt cheated at the candidate selection process. One of the sorest points from the whole sorry saga must be the idea that he was a placeman for Tony Blair, a Prime Minister who Dobbo went on to continually criticise, publicly, over the worst excesses of New Labour. The war in Iraq, the privatisation of council housing and so on. Blair’s New Labour machine was desperate to stop Livingstone becoming Mayor on the grounds that he might derail the part-privatisation of the tube. Frank got caught up in the shambles, losing his job as Health Secretary in the muddle. For those wanting to revisit that muddle, there are several interesting remnants on the web. 1. Frank’s campaign website, or the shell of it, is still online HERE. You can see the likes of Nicky Gavron and Andrew Dismore, currently on a mish to unseat Brian Coleman in Barnet and Camden, were Frank fans, rather than rebels for Ken – the man they now stand shoulder to shoulder with. 2. The transcript of Panorama’s ‘Blair Mayor Project’ investigation, which alleges Frank’s campaign team had access to London membership lists unavailable to Livingstone and Hampstead MP Glenda Jackson as they all sought the official Labour candidature is HERE. Yep, Glenda was in the running too. 3. Matthew Norman’s merciless teasing of Frank HERE, complete with the catchphrase ‘oooh you amaze me’. Some of this stuff doesn’t add up with what happened next and the way Frank went onto oppose Blair in the years after. 4. Footage of how the whole mayoral election was covered abroad HERE. There is also the rather silly passage in Blair’s book, A Journey, in which he suggests he had admiration for Ken Livingstone because of his “quirkiness”. Frank and his wife Janet were even invited to Downing Street for a drink in which Frank took umbridge to Blair’s idea of giving up the campaign he had already started. Still, in the last two or three weeks, a common lament from Labour people in Camden and beyond, some members, some just natural Labour voters, is that Boris could be beaten if we had a different candidate. They don’t mean Oona King, but they moan that Ken looks like a man who thinks he will lose in the television hustings, fatigued by a groundhog day election and fighting to convince his own voters before pulling in the floaters. That’s a striking turnaround from the days when he was so loved that traditional Labour voters turned away from the red rose on the ballot paper to back him. Maybe Frank should have stood this time around. It’s not something I’d dare ask him.